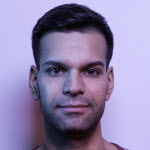 Rodrigo has been working in tech for over 7 years, initially as a Front-End Developer and currently as a User Experience Researcher. It was through the intersection of programming and UI/UX that his growing interest in usability and design thinking ended up leading him to a career shift in UX. With focus on research, prototyping and usability testing as means to amplify the user’s perspective in the design process of digital products, he is currently based in Berlin, Germany, where he works at Contentful as a UX Researcher.